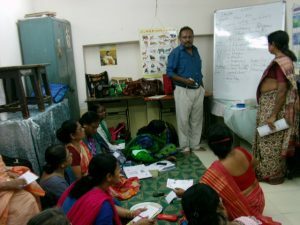 With the children on their summer break, 17 teachers from CRS’s Education Centres gathered together on 17th, 18th and 20th May for a three-day programme of review, discussion and planning. Led by the CRS Director and the Coordinator of Education Projects, the group reviewed the teaching syllabus for different age groups, discussed the setting of test questions for each unit, and presented ideas for enhancing the students’ experience. CRS Education Centres prepare children for enrollment in mainstream schools, with a focus on core skills of Bengali, English and maths. There are currently Education Centres in 8 urban projects and 4 rural projects catering for almost 900 children across pre-primary and primary ages from 2 to 12 years.